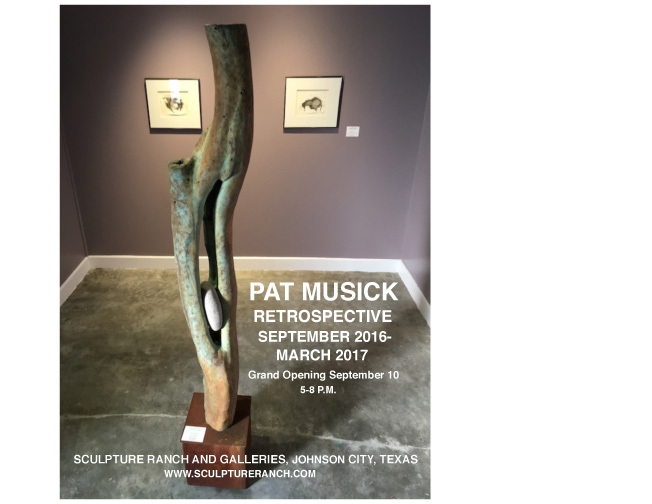 On September 10, 2016 Pat Musick will celebrate the opening of a retrospective exhibit at the Sculpture Ranch and Galleries in Johnson City, Texas. Featuring work from the past twenty-five years the show contains twenty-nine sculptures from ten different series, on view until March, 2017. Included in the display are her strong environmental statements that range from Epilogue to Our Fragile Home. Musick, whose large scale work is in over fifty museum and corporate collections in the United States, taught for many years at the University of Houston. She is the author of four books on art, and a prominent lecturer. She is married to Gerald P. Carr, retired NASA astronaut who is now her collaborator and engineer. Their largest sculpture (sixty-five feet) is permanently installed on the grounds of the Crystal Bridges Museum of American Art in Bentonville, AR. Several of the works they created together are in the retrospective. Lucas Museum of Narrative Art . “Musick’s work has the power to move us, even in these world-weary times. The exhibit is curated by Joe Bravo from the San Antonio Museum of Fine Art. The Sculpture Ranch and Galleries is located on the former President L. B. Johnson hunting ranch in a redesigned 8,000 square foot building that served as an airplane hangar.